Today I have the second half of the Orly Fall Electronica Collection, Decoded and Preamp. I started with three coats of the shimmery pink Preamp and added a gradient dot effect with the dark gray Decoded. I LOVE the pink and gray color combo. This one turned out better than I thought! My pics are a little inconsistent because I was having trouble with lighting. It's starting to get darker so much earlier already! This was fast and easy. I used the plastic end of a sewing pin for the big dots and a small dotting tool for the smaller dots. I finished with a coat of Seche Vite to smooth the dots and add shine. Preamp is a medium pink with tons of gold shimmer. It's almost electric looking. I truly don't have any other pinks quite like it. The pic above is without topcoat (an oversight by me!) so it doesn't really do the shimmer justice. Here's a closeup of the bottle. Cool, right? Decoded is a darker gray creme. If you've followed my blog...then you know I love gray and I love cream...so this was a winner for me. Although I probably already have something just like it - not sure! :) In my opinion, this was the runniest of the bunch. It dried fast though. I dinged my nail on the table before a coat of Seche Vite and it didn't make a dent. 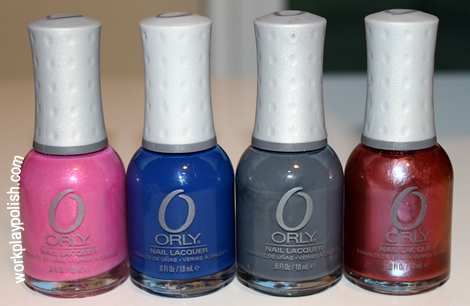 Here is the entire Orly Electronica Collection. Click the links to see my manis with Shockwave and Synchro. Overall, I really like this small and concise collection with just four polishes. They're all very different, but they all make sense to Orly's "man and machine" inspiration. I actually wish more collections had fewer polishes. The Orly Electronica Collection, as well as China Glaze, Essie and other nail and beauty products are available at Beauty Stop Online for 50-75% off retail prices. They also have free shipping for orders over $50.